If you're looking for a casual yet absolutely chic ensemble, consider teaming a Rick Owens hooded shell trench coat with a white midi dress. Both garments are totally comfy and will look fabulous paired together. A pair of white leather ankle boots will integrate smoothly within a variety of looks. 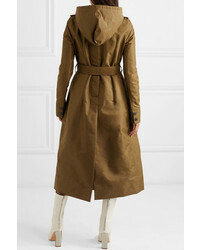 Why not team a Rick Owens Hooded Shell Trench Coat from NET-A-PORTER.COM with charcoal jeans? Both pieces are totally functional and will look great paired together. To add a touch of casualness to this look, introduce black leather flat sandals to the equation. 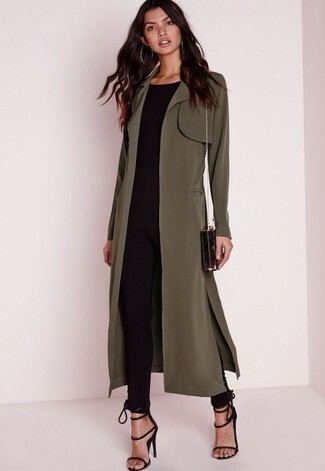 For an ensemble that offers function and chicness, opt for an olive trenchcoat and black ripped skinny jeans. You can get a bit experimental with shoes and add a pair of black and white high top sneakers to the equation. 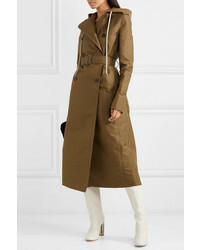 A Rick Owens olive trenchcoat looks so sophisticated when married with black skinny pants. Complete this ensemble with black suede heeled sandals and ta-da: this look is complete. This combo of a Rick Owens olive trenchcoat and white and black houndstooth dress pants looks phenomenal, but it's also very easy to recreate. 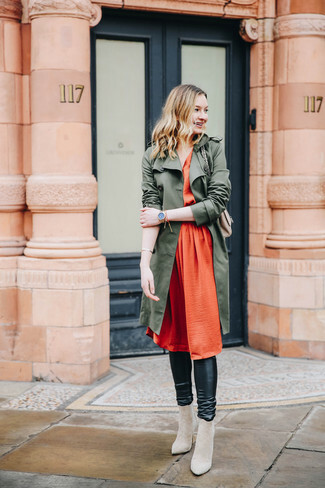 Consider black cutout leather ankle boots as the glue that will tie this look together. 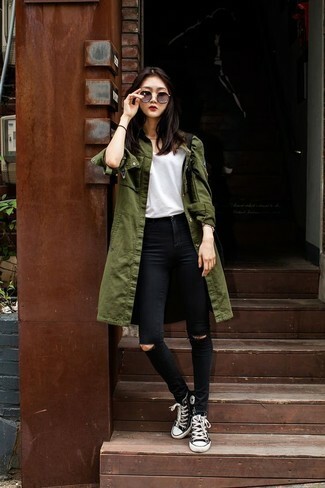 If you're looking for a casual yet totally stylish outfit, try teaming an olive trenchcoat with blue ripped jeans. Both pieces are totally comfy and will look fabulous paired together. Add a glam twist to your getup with black leather heeled sandals. 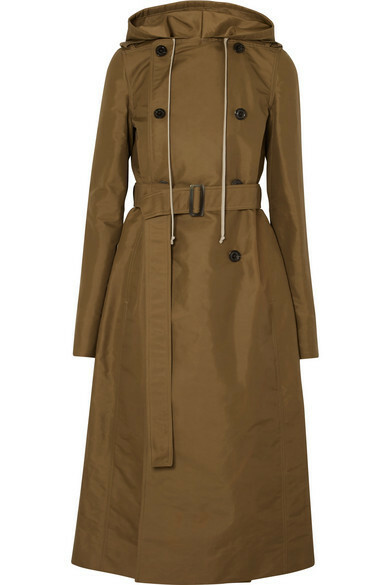 For a look that's refined and absolutely drool-worthy, opt for an olive trenchcoat and a black sweater dress. Balance out your ensemble with a more laid-back kind of footwear, like this pair of black leather lace-up flat boots. If you're hunting for a casual yet absolutely chic ensemble, try teaming a Rick Owens hooded shell trench coat with black leather leggings. Both pieces are totally comfy and will look fabulous together. Let's make a bit more effort now and throw in a pair of beige suede ankle boots. Go for a simple but edgy and casual getup by pairing a Rick Owens Hooded Shell Trench Coat from NET-A-PORTER.COM and black ripped skinny jeans. Get a bit experimental when it comes to shoes and spruce up your look by rounding off with a pair of dark brown nubuck ankle boots.